I cannot believe Sammy turns 5 next week, 5! 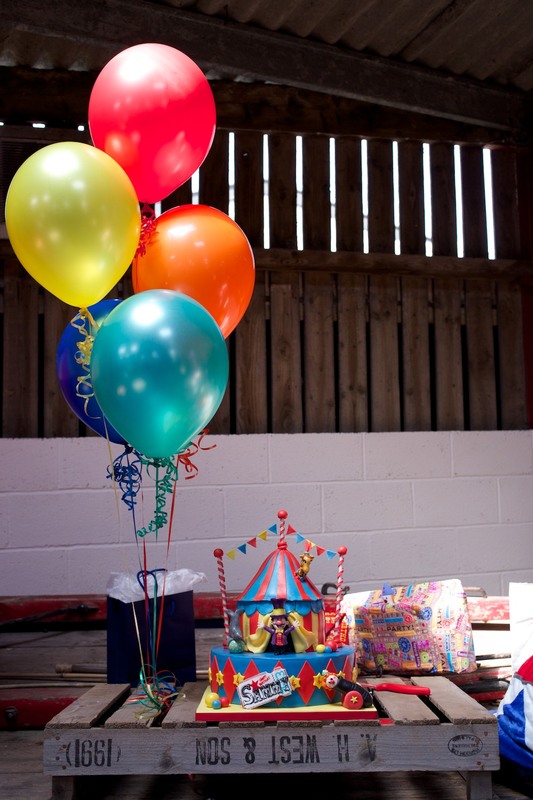 And I cannot believe I never blogged his awesome Circus party from last year. I wrote a quick sneak peek post and then the 500 odd photos I took seem to get buried in the archives! And that was with the lovely Emily snapping away for me too! With the party preparations for his 5th Fishing Party well underway I just had to share his Circus antics with you before everything turns fabulously fishy! We have a local farm park near us Court Farm Country Park and they kindly let me hire out the large barn and indoor barked play area. Lucky because it turned out to be a scorching day, the park was busy with farm go-ers, but we had the space all to ourselves! I love the little things. The things you worry will go unnoticed but take the longest time and effort. But no, everyone was taking their own photos, embraced the photo booth set up on the stage area with the amazing vintage Carousel horse and sign from Traditional Fair and all the mini games were so well used the floor around the hook a duck was soaked! I found goldfish bath squirters on eBay and made up freezer bags of water just like at a fair ground as prizes and the DIY tattoo station went down a storm. I used a cardboard market stall stand from Ikea as a kissing booth where you had to guess the number of Hershey chocolate kisses were in the jar and found a great set of downloadable printables on Etsy from Simone Made It with a rainbow coloured Circus theme. I love having a few unorganised games set up for party guests to play as they please. I always find, unless you have a very small number of guests, pass the parcel can be terribly long and drawn out, plus my boys always want to win so they end up bored and frustrated! At Sammy's age it's also hard to be out and have to watch whilst 28 other people join you on the sidelines for musical bumps or statues so instead, I give out little sweets and keep everyone joining in until the end. The party food table was decoration in itself! The big top hanging canopy from Ikea hung above some striped fabric made a perfect backdrop and all the little Ikea circus soft toys made wonderful props and party favours for the babies invited at the end! I wrote a post last year about How to Style the Perfect Party Table so you can read some hints and tips if you are planning a party too. I sourced cup cake toppers on eBay, skewered Flumps onto cake pop sticks, made up little pots of honeycomb, popcorn and candy as well as providing Circus theme lunch boxes with the main children's food inside. I always see curly sandwiches left over so instead here is my guide to the Perfect Party Tea! The cake was magnificent and from the same talented baker DusiCake who made Ollie's Doctor cake and Sammy's Wonderpets cake the year before. I never understand why we all traditionally hide the cake away, that we've either spent lots of money on or lots of time and effort making, only to reveal it for a matter of minutes then scurry it away again to get chopped up into party bags, where it invariable gets squished before it gets eaten! I say display it proudly! Sammy loved seeing his cake and admiring it before the big chorus of Happy Birthday. In fact I believe he appreciates a beautiful cake far more this way! Plus the barn wagon made an incredible cake stand! Our family and old friends live quite a distance away, so our birthday parties are more like family fun days as it's a chance for the grown ups and the children to catch up and have a good time. I was lucky last year to work with Party Delights who supplied all the coloured decorations, the streamers, lanterns and hanging decorations as well as featuring the bouncy castle company AW Inflatables and Court Farm which helped reduce the hiring costs. Ps. top tip - piñatas are great fun but impossible for little ones to break! Choose one with pull strings instead! A local child entrepreneur Billy offers a brilliant disco service for £10 an hour and we book him for all our parties! There was a moment when I just stood and was overwhelmed watching all the grown ups and children dancing together! The finale was a tractor ride for as many party guests as we could fit on the farmers tractor trailer! An amazing end to an amazing party! This year is all about fishing! 2 weeks to go so I am in full party prep mode with the help of Style My Party who have created a whole new range of "Gone Fishing" party ware which you can find here. We love parties in this house - Ollie is requesting a pink party for his 3rd Birthday this Summer, reckon I can recycle the Flamingo decorations?! !